What makes a beagle a beagle? 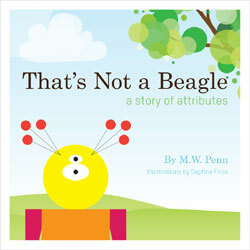 Begin to teach attributes, data collection and data distribution with this whimsical story of a lost beagle and an alien determined to find a little boy’s pet. The book has a glossary and activities by Adam Goldberg, Ed. D., and addresses the mathematics Common Core State Standards for measurable attributes and collecting/representing data in grades K through 3. © M.W.Penn. Website by We Love Children's Books.